BANGI, June 27, 2014 – The Department of Islamic Development Malaysia (Jakim) has not ruled out foul play in the case of some Cadbury chocolate samples found to contain porcine DNA recently. 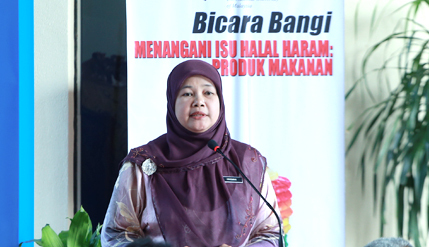 Hajjah Hakimah Yusoff from the Halal Hub Division of the Office of the Director of Jakim expressed confidence in the Halal test methods conducted on all types of Cadbury chocolate a week before the posting on social media alleging the Ministry of Health had found porcine DNA in two types of Cadbury chocolates. Hakimah told a Bicara Bangi forum here today that the department conducted extensive tests to verify the halal certification for Cadbury through the Chemistry Department. The forum was organised by the Chancellory Department of The National University of Malaysia (UKM). Other panellists in the forum were Professor Dato’ Zakaria Stapa from FPI, Assoc Prof Dr Sahilah Abd Mutalib from the Faculty of Science and Technology (FST) and Datuk Dr Osman Ma’amor of the Islamic Consumers Association. Hakimah said Muslims should not have any doubts on the certification issued by JAKIM though there were certain parties who deliberately tried to discredit Cadbury and JAKIM itself. “People can inject things into some chocolate samples and send them to the Ministry of Health laboratory, although other samples obtained by the Department of Chemistry Malaysia were uncontaminated, said Hakimah. Official results by JAKIM carried out on Cadbury Chocolates samples on June 2 showed there were no porcine DNA traces nor any contamination detected in two Cadbury chocolate samples taken directly from its factory even though the laboratory of the Ministry of Health found two Cadbury chocolate products contained porcine DNA. The Chemistry Department laboratory tests had also not found Cadbury Hazelnut and Roasted Almond to contain any hog DNA based on results released on June 2. Prof Zakaria said the public should accept JAKIM’s findings as valid as it had carried out extensive research under very stringent conditions. Prof Zakaria, who is also adviser of the National Fatwa Council said the council confirmed JAKIM’s findings and called on Muslims not to be suspicious of the department. He regretted that some people had been sceptical about the government’s announcement. There is a crisis of confidence on authority, he said cautioning the people not to just believe everything that is posted on social media. Datuk Dr Ma’amor questioned why JAKIM did not have its own laboratory for testing as promised by the government some 10 years ago. He said it was difficult for the public to have confidence in JAKIM if it is too dependent on other institutions for Halal certification, like the Chemistry Department. Dr Sahilah expressed confidence in the Chemistry Department which she said had provided excellent service and received international accreditation of ISO 105 to detect the presence of non-halal items in food products. She said the department uses very sensitive methods which can detect porcine DNA in as little as 0.005 mg.
Prof Dato’ Dr Mohd Yusof Hj Othman from HADHARI moderated the forum.